National Council of Churches in India: NCCI MOURNS THE LOSS OF ITS PRESIDENT, BISHOP DR. TARANATH S. SAGAR. 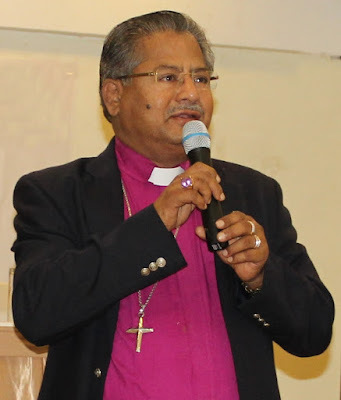 Bishop Dr. Taranath S. Sagar, President of the National Council of Churches in India (NCCI) from 2008 to 2015, and Bishop of the Methodist Church in India, suffered a heart attack and passed away at about 8:00 pm on Monday, October 19, 2015 in Bangalore, India. His untimely demise has shocked and deeply saddened everyone. His contributions to the Church and ecumenical movements in India and abroad have been profound and unprecedented. As a prominent dynamic leader not only locally and all over India, but around the globe, he served as member of the central committee of World Council of Churches (WCC) elected first at the Port Allegro Assembly, Brazil in 2006, and again at the Busan Assembly, South Korea in 2013. He was member of the constitutional amendment session during the Christian Conference of Asia (CCA) Extraordinary General Assembly for constitutional amendments in May 2015 prior to the General Assembly. He has been a member of the Executive Committee of CCA since its last General Assembly held in Jakarta in May 2015. Even as a humble pastor of the Bombay Regional Conference of the Methodist Church in India serving local congregations in Bombay over three decades ago, his pastoral heart won him the love of the masses. Over the years he held several important positions at various times including President of the Council of Bishops of the Methodist Church in India, President of the Asian Methodist Bishops Conference, Secretary of NCCI’s Maharashtra Council of Churches, President of Ecumenical Christian Centre, Executive member of United Theological College in Bangalore, President of ECLOF, and many others. He has contributed immensely also to the formation of ministers and ministries. His guidance and insights have resulted in many important accomplishments. His life has proved to be a blessing to individuals and communities, and will continue to inspire the journey of faith, witness and Christian service. As president of NCCI, Bishop Sagar had a large ecumenical vision and was successful in articulating goals and strategies. He gave a certain impetus and vibrancy to the work of NCCI in the direction of commitment to the dalit cause, mainstreaming of socially and religiously excluded communities like People Living With HIV and AIDS (PLWHA), sexual minorities, Disabled, Aged, Children, etc. His concern for youth and women’s empowerment, and justice issues concerning Life and all creation, have been remarkable and provided the map for many ecumenical milestones achieved by NCCI. His passion for the Church’s mission for affirmative action and also the status of the Church, especially in light of the socio-political situation, has been a source of great strength. “Bishop Sagar has been many things to many people: a loving family person, pastor, friend, preacher, guide, visionary, builder, administrator, a Methodist and ecumenist. The National Council of Churches in India has been blessed to have him as its President at a crucial time in its history, 2008 to 2015. With his vast experience, wisdom and determination, Bishop Sagar was able to help NCCI tide over its difficulties. With his winsome smile, his witty comments, his wise acumen, or with his passionate stand he could resolve issues, and give the needed support and strength to the work of NCCI.” (Rev. Dr. Roger Gaikwad, General Secretary, NCCI). Our prayers for God’s comfort and peace to the bereaved family - Mrs. Padma P. Sagar, their son, Mr. Sunnadh Sagar and daughter, Mrs. Sharan. We pray thanking God for the blessings we have received through the life and ministry of Bishop Dr. Taranath Sagar. We pray also that God would strengthen the Church and the Ecumenical movement to continue the work and vision of our dear Bishop and thereby pay a fitting tribute to a brilliant Ecumenist, true Christian and a leader par excellence. The funeral service will be held at 11:00 am on October 21, 2015 at the Richmond Town Methodist Church, Bangalore.